Until the late 1990s deep-sea fishing meant using a big heavy reel spooled with heavy monofilament line. The preferred line weight had for decades been 24kg (50 lb) mono. The problem though was that in deepwater – anything over 100 meters or so – the angler couldn’t feel the weight of the sinker, or more importantly, couldn’t detect a fish nibbling the bait. You would lower your sinker down towards the bottom, but would have no idea when, or if, the sinker had touched the seabed. If there were strong currents, or a strong tide running such as near a channel entrance, the problem was even worse! You then waited a while before winding line back on the reel. After cranking the handle for some time you would eventually discover that a fish had taken the bait when weight came on the rod. Not a very exciting way of fishing to be sure! The problem is that monofilament stretches under load. The more line you have out; the greater the stretch. This stretching can be as much as 30 percent – even more with cheaper lines! For bottom fishing braid is way superior to mono. It is now 2015 and I can safely say that braided lines have now completely taken over from monofilament for all form of bottom fishing at sea, including jigging, all bait fishing, deepsea fishing, lure fishing with poppers, spinners and softbaits. The ratio looks something like 50/50 between mono and braid when it comes to salmon angling in 2015. For fishing the canals around Twizel with softbaits braid would now be fished to by close to 100 percent of anglers. The new super lines have revolutionized deep-sea fishing. They have very little stretch – perhaps not more than 3 percent in 100 meters. They are also very thin for a given breaking strain compared with monofilament. These new lines are produced by a number of manufacturers and sold by different companies. These braided lines have names like: Spectron, Sufix, Spectra, Spiderwire, Fusion and Tiger Braid, to name a few. These lines are more expensive than monofilament. There are a number of different brands available on the market. Some very good, and others not quite so good. The best of all is 100 percent fibre Spectra also known as Spiderwire. It is ten times stronger than steel. This is a jell spun wax braided line made by Allied Signal in the United States . It was originally developed for use in lightweight bullet proof vests. Spectra is also the most expensive of the super lines. A bit less expensive, but also very good, is Tiger Braid marketed in New Zealand by Alexto Sports. Also good, but less expensive, is Fusion. Rather than a braid, Fusion is instead long strands of Spectra coated on the outside with a type of PVC much the same as a fly line. Fusion is also slightly bigger in diameter for a given line weight compared with Spectra and Tiger Braid. So you can’t get quite as much on your reel as the braids. This combination of low-­stretch and smaller diameter gives these new lines many “wire-like” properties, both good and bad. Braid can slice through mono like a hot knife through butter. When deep-sea fishing, anglers using braid will have their sinkers fall almost vertically towards the seabed, while the lines of those fishing mono take a much less direct route. In the ensuing tangles the braided lines can easily cut through the mono lines. The “braid” anglers also get an advantage on a party boat because their lines fall quickly, straight to the bottom, so they get first shot at the fish on new ground. They tend to be winding fish back up before anglers with mono get anywhere near the bottom! For the reasons outlined almost all “experienced” deep-sea anglers now fish with these new super lines. Indeed some of the charter fishing boats operating in Canterbury now provide anglers with rod combos spooled with heavy braid. I say heavy braid because as their diameters are so thin, heaps can be fitted to a smaller reel than is the case with monofilament. There­fore many anglers, and some of the charter skippers, now spool their reels with 80 lb (36kg) or 1301b (60kg) braid. Heavier braid will last longer, and there is nothing to be gained by going lighter when deep-sea bottom fishing for groper and so on. You do have to be careful laying line across your spool with braid or you can end up with cut fingers. The one thing you certainly would never do is wrap it around your hand and pull, not even when tying knots. It can easily cut to the bone! By the way, the only knot I use with braid and Fusion is the spider hitch. You can also use a Duncan Braid Loop knot, or a double strand Uni Knot. A dab of Super Glue over the knot is also a good idea to prevent the possibility of the knot slipping. There are a couple of other considerations to keep in mind also. Braid especially can cause rapid wear of poor quality rod guides and tip rings. I prefer a roller tip on my deep-sea rods for this reason. The almost zero stretch also makes it a good idea to use a slightly softer rod so there will be at least some “shock absorber” affect! For example use a 15-24kg rod with 80 lb and 130 lb braid. Always use quality ball bearing swivels as the life expectancy of braided lines will be reduced if it is subject to excessive twisting. Also avoid chaffing on boat keels and fittings. This is particularly important with Fusion which can be ruined if the outer coating is scrapped off! You can expect your braid or Fusion line to last for several years at the very least, even if you do a lot of fishing. Always fish the outside of the drift at all times. Never use the rod and reel to winch off snags; you’ll usually destroy both! Carry a 200mm long length of 15mm wooden dowel and use it to wrap your line around to pull free of snags by hand. Braided line is not such a good idea for trolling. It has been known to actually unwind the braiding, and also there is no “give” in the line. A sudden violent strike from a fish can rip the hook straight out. However a proven successful technique for trolling with braid is to “top­shot” your reel with monofilament. Just keep say 50 meters of mono wound onto a line spool in your tackle box. Have a loop in the end of the mono and pass the whole spool through the loop in the end of your braid, then wind the mono off the spool onto your reel over the braid. 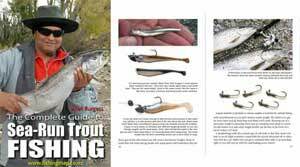 This way you can use the same rod and reel for both bottom fishing (braid) and trolling (with the mono “top­shot” wound on). When tying your bottom rigs always connect your sinker with a “break away” weak link. If you get snagged on the bottom it is better to loose a sinker than have to cut your expensive braided line at the rod tip! You should be OK with the hooks. If they snag they’ll straighten out. I have actually witnessed anglers without this “weak link” loop their lines around the stanchion on the stern of the launch so the skipper can use engine power to break them free of a snag. There is no way of knowing where the line will break! With braid being much thinner than monofilament, for a given line weight, it is possible to fish a much smaller and lighter reel. This is good news. You can burn plenty of energy just keeping your balance on a rolling deck without having to wrestle a big reel as well. I have been able to spool 300 yards of 80lb Cortland Spectron on to my Shimano TSM IV reel. If it were spooled with mono the most it would hold would be 300 yards of 30lb. The 6:1 gear ratio on the TSM IV is a bit too high for serious deep-sea work. You have to pump the rod hard as the high gearing prevents the reel being used as a winch! However for general bottom fishing in water up to 100 meters or so it works great, being very light and easy to handle. One last thing worth mentioning is that braid must be wound onto your reel under very tight tension. Failure to do this can result in loops of braid sinking down between those lower on the spool when you hook a fish. This can result is a horrific “jam-up” which no end of pulling on the line can unlock! People have snapped rods trying to free such jammed reels! For this reason if you aren’t too sure what you are doing it would definitely pay you to have the tackle shop spool your reel for you. You might even save a bit of money in the process if they have bulk spools from which they can load your reel. If you do get caught out and your line isn’t tight enough on your spool wait until the boat is underway, then tie on a sinker or Rapala lure and let all your line out behind the boat before winding it back on under tension. This would of course be a dangerous thing to do with monofilament line which expands on your spool as it seeks to return to it’s original shape, and can blow your spool apart as it does so! Braid on the other hand doesn’t expand. If you don’t have sufficient super line braid to fill your reel spool, the best backing is ordinary braid because the two braids can be joined successfully. If the spool is going to be backed with mono don’t tie the super line to it as there is no known way to connect the two together. It is also a good idea to use a bit of soft rubber tube over the line as a shock absorber to prevent your swivel breaking your tip ring when winding in. I wouldn’t use braid for all my fishing. For a start I’ve got a lot of reels and spooling them all would cost a fortune. 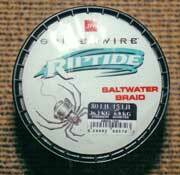 Super lines can also be used for trolling and casting provided you keep a loose drag setting on your reel. For casting you should have a “tunnel” tip guide, or at least a very small diameter tip ring to minimize loops during casting. Super braid and Fusion lines really give you the edge in deep water. Once you get used to bottom fishing with them you’ll never go back to mono! Braided lines are now very popular for spin fishing with fixed spool reels. For sea fishing with soft plastic baits braided lines are now very popular. In fact they have almost taken over from monofilament for this type of fishing as well. I now often see trout and salmon anglers fishing braided lines as well. Some brands of braided fishing line are excellent. While some of the cheaper and slightly thicker “copies” tend to fray quickly, loose their colour, and just don’t last very long. However several of the less expensive brands of braid are just as good and are excellent value for money.